EASY TO OPERATE: Fully automatic simple electric plug in design with the control center placed on the top panel and soft touch digital buttons along with led indicator lights. A smart device at your family's service! 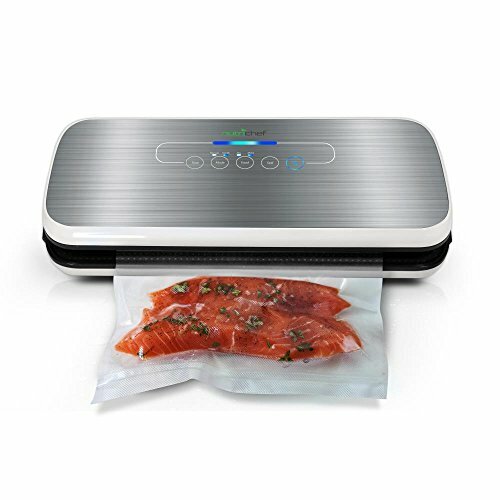 A FULL STARTER KIT: Apart from the vacuum sealer and the air suction hose, the NutriChef vacuum sealer package also includes a wine stopper cork, 5 medium vacuum bags (7.8" x 11.8") and one extra long vacuum bag roll (7.8" x 79.0"), both kinds being reusable and waterproof. A complete bundle for your new cooking era.